This angel was a beautiful piece of graffiti on South William Street in Dublin. It was there a long time: I saw it often. I never thought to write a story about it. I would resent that now that Ruth Frances Long has written one and thus proven to me what I failed to imagine, except I’m just really, really *happy* that Ruth wrote this book, and let me tell you, it’s always a relief when a friend writes a book you genuinely like. 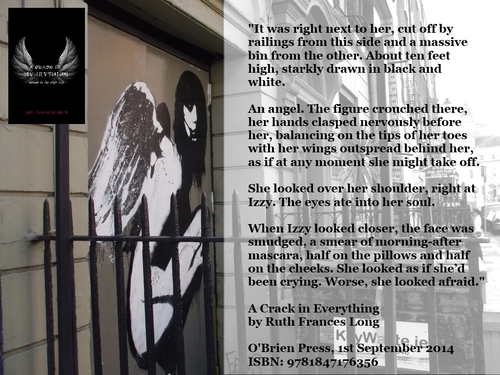 A CRACK IN EVERYTHING is urban fantasy set in Dublin, which–you would think–would be ubiquitous: there’s so much Irish mythology and history and legend mined for books that you’d think loads of contemporary fantasy would be set in the Fair City itself. But no: there’s very little, or at least very little that I know of. My husband and I have often wished there was lots of it out there, so I’m simply delighted that Ruth has gotten this book out there for the world to read. As Ruth herself said, she’s tried to draw on local legend and fairy tales as much as the greater, more widely known Irish mythos (and then throwing it all up against the war between Heaven and Hell, as you obviously do), and I think she’s succeeded admirably. A CRACK IN EVERYTHING has both got broad scope–the depths of Dubh Linn, the Sidhe’s side of Dublin–are enough to drown in–and intimate appeal: the protagonists, both human and not, are in fact in over their heads and well on the way to drowning. Our heroine, Izzy, is one of my favourite kinds of protagonists: the one who doesn’t know what she’s gotten herself into, and has to figure her way out…while everybody is trying to keep her in. I thought her struggles were well portrayed and that her end game turned out to be damned clever, and I saw almost none of it coming, which is always a pleasant surprise. It’s not perfect: the early part of the book suffers a little from Establishing Place, which is both kind of necessary (one does not see Dublin depicted in film as often as, say, New York City, or even Seattle) and kind of hard to do elegantly. And some of it *is* done elegantly, very elegantly, but other parts felt a bit belaboured to me–but it may very well work better, in fact, for people who aren’t familiar with Dublin and its surrounds, because we already know this stuff. That said, the rough spots early on smooth out and the story becomes thoroughly engrossing, to the point where I, um, may or may not have allowed my four year old to watch rather more television than he should have, so I could finish reading the last five or six chapters, because I *really* didn’t want to put the book down at that stage. Was bummed when I saw it wasn't available on Amazon USA. Then remembered The Book Depository (with free worldwide shipping))--it's ordered! Sounds wonderful! Looking forward to when it is available as an ebook.